Edinburgh based charity Ecas, which works with physically disabled people in Edinburgh and the Lothians, is supporting a wheelchair basketball player who is heading to Worcester with the hope of joining Team GB and being selected for the Paralympic Games in Rio 2016. Robyn Love, who has previously represented Scotland, has received support to help her buy a new wheelchair, as well as with some of the general costs of participating at the highest levels. 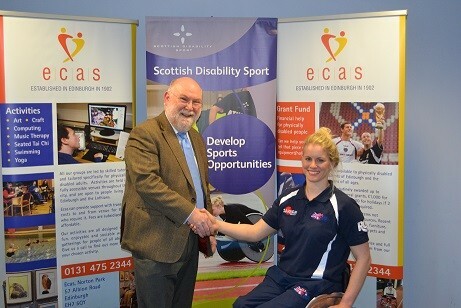 Gary Fraser of Scottish Disability Sport, said: “we are delighted to have developed a strong relationship with Ecas in order to financially support our athletes striving to realise their potential as a performance athlete. These funds are administered alongside our Athlete Academy - a support mechanism underpinning the sportscotland Institute of Sport – that supports athletes at an integral stage of their development. Robyn is a member of the Academy and we have been extremely impressed with her emergence and development over the past 12 months. We wish her all the best in her new training environment in Worcester, where she will battle to be part of the GB team, and hopefully reach the 2016 Paralympic Games in Rio”.